Among them were missile scientists from Belarus and North Korea who were employed in different departments of the large industrial complex outside Masyaf in western Syria. Those sources disclose that, whereas Israeli has raided the complex before, this time the attack was massive and, unlike before, gutted most of its installations. Especially targeted were the sections working on the upgrade of Syrian and Hizballah surface missiles, the production of solid fuel for those missiles and the departments focusing on installing new guidance instruments to enhance their precision. North Korean engineers were working on the production of solid fuel, while Belarusians were in the pay of Syria’s Organization of Technological Industries. Behind the fancy title is an organization that specializes in breaking the UN-US embargo against the employment of expert manpower in Syria’s military production and the sale of military hardware to the Assad regime. Most of the Belarussians working at Masyaf were provided by the Belvneshpromservice whose military ties with Damascus go back years. 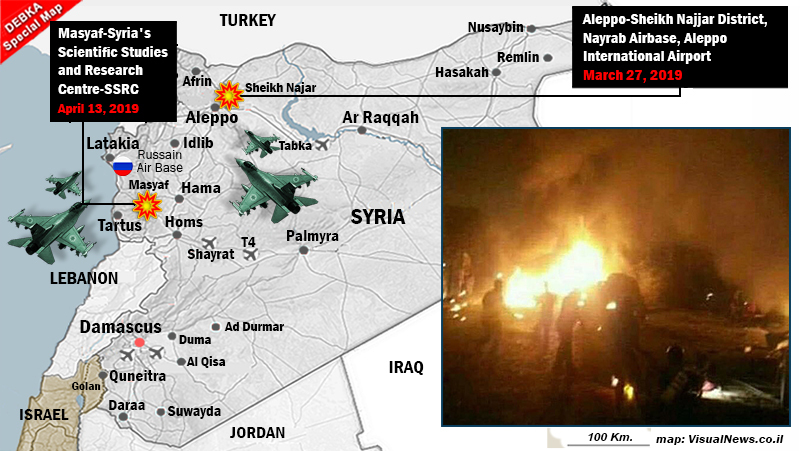 On Feb. 27, Israel struck Iran’s newly established command centers and weapons stores in Aleppo. This entry was posted on April 15, 2019 at 2:50 PM and is filed under Uncategorized. You can subscribe via RSS 2.0 feed to this post's comments. You can skip to the end and leave a response. Pinging is currently not allowed.